Prominent & Leading Manufacturer from Panipat, we offer air force blanket. With the backing of our masters and refined in-house offices, we have had the capacity to offer an exhibit of Air Force Blanket. Our blanket is designed for our clients by staying informed regarding business slant by our devoted experts. This blanket is broadly utilized by our clients for its life span, non-abrasiveness and fine completing in stitching. Besides, we are putting forth the blanket in distinctive prints and designs at ostensible costs. 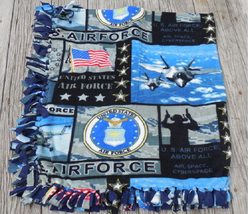 Looking for Air Force Blanket ?